Fueled by her passion for addressing systemic barriers and known for her boundless energy and sharp analytical mind, Judith Katz brings over 30 years’ experience to her work in strategic culture change as Executive Vice President of The Kaleel Jamison Consulting Group, Inc. 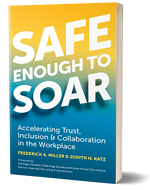 Her latest book, co-authored with Frederick Miller, is called Safe Enough To Soar: Accelerating Trust, Inclusion, and Collaboration in the Workplace. Find out more here.